← Mercury Fillings – Is It Worth Taking the Chance? BioDental Healing is proud to announce that our very own holistic dentist, Dr. David Villarreal, was very recently featured in a column in the San Fernando Valley Business Journal. 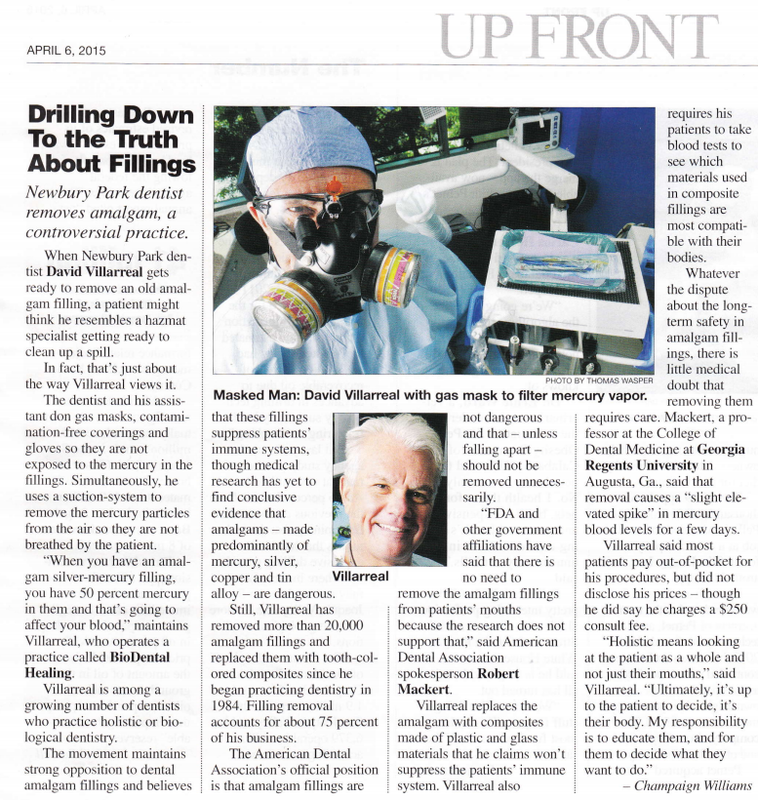 The column focuses on the controversial topic of amalgam filling removal and the seriousness involved in the entire process from start to finish. To confirm: yes, we do take amalgam fillings very seriously as we strictly believe they are something that should not be in the human mouth. What’s Up With “The Hazmat Suit”? You might be wondering what the deal is revolving the use of gas masks and other equipment needed to extract and replace mercury fillings. Sure, we’ll explain. It’s to make sure that Dr. Villarreal himself (and his assistant) are not exposed to any of the mercury during the removal process. Of course, the patient is just as protected from mercury exposure this way no one in the room is exposed – which is very important. 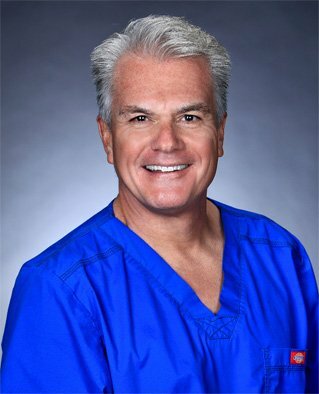 Dr. Villarreal has been doing amalgam fillings since 1984, having performed 20,000+ mercury filling removals using a strict removal process known as “mercury safe protocol” which seeks to protect both the patient and the dentists/dental assistants involved. 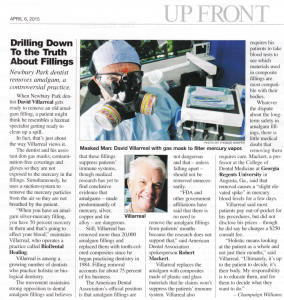 If you read the column, you’ll notice the FDA’s position on removing amalgam fillings – to which they claim should not be done because “the research does not support that”. As Dr. Villarreal explains in the column, “My responsibility is to educate the patient [on the dangers of mercury in the mouth] and it’s up to the patient to decide what’s best for them.” Dr. Villarreal provides thorough consultations to all of his patients. We want to specify that Dr. Villarreal does not only perform mercury filling removal, but offers many other dental services as well. Dr. Villarreal specializes in removing mercury fillings, but also provides dental implants, dental checkups, teeth whitening, and even offers nutrition counseling as part of an optimal holistic approach to dentistry. Dr. David Villarreal’s holistic dental practice, BioDental Healing, is located in Newbury Park serving all surrounding cities including Thousand Oaks and Simi Valley. This entry was posted in BioDental Healing, Dr. David Villarreal and tagged biodental healing media, dr. david villarreal media, holistic dental news, san fernando valley business journal. Bookmark the permalink.